Who can resist those big brown eyes and cute doggie grin? 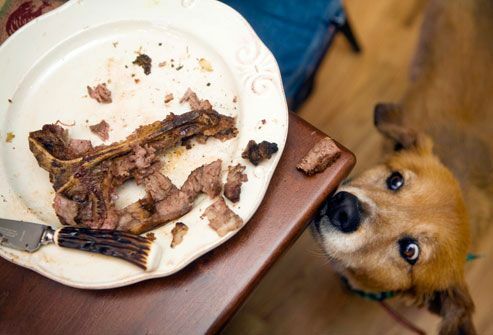 Can a little reward from the table or getting into Mom or Dad’s stuff really hurt your dog? Well, that depends on what it is and what's in it. 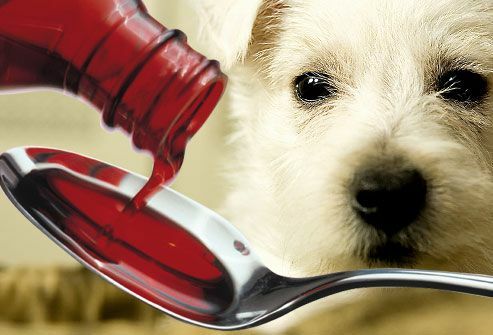 If it contains the sweetener xylitol, it can cause your dog some real problems. In fact, there’s a lot of people food your dog should never eat. And, it’s not just because of weight. Some foods are downright dangerous for dogs -- and some of these common foods may surprise you. Candy, gum, toothpaste, baked goods, and some diet foods are sweetened with xylitol. It can cause your dog's blood sugar to drop and can also cause liver failure. Early symptoms include vomiting, lethargy, and coordination problems. Eventually, your dog may have seizures. Liver failure can happen within just a few days. Is a treat from the table OK for your dog? That depends on what it is. Avocados, for example, have something called persin. It’s fine for people who aren't allergic to it. But too much might cause vomiting or diarrhea in dogs. 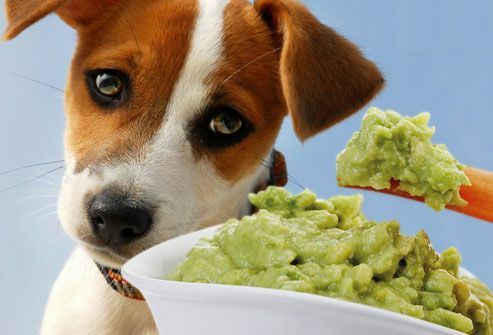 If you grow avocados at home, keep your dog away from the plants. Persin is in the leaves, seed, and bark, as well as the fruit. Also, the avocado seed can become stuck in the intestines or stomach, and obstruction could be fatal. 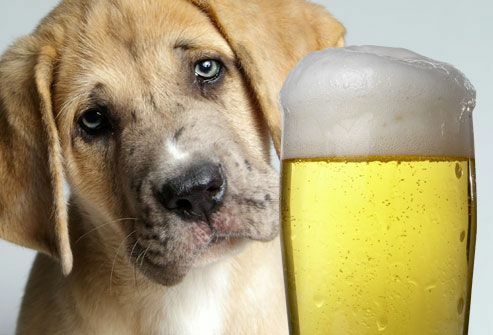 Alcohol has the same effect on a dog’s liver and brain that it has on people. But it takes a lot less to hurt your dog. Just a little beer, liquor, wine, or food with alcohol can be bad. It can cause vomiting, diarrhea, coordination problems, breathing problems, coma, even death. And the smaller your dog, the worse it can be. 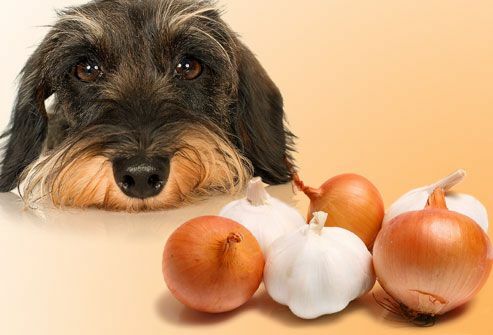 Keep onions and garlic -- powdered, raw, cooked, or dehydrated -- away from your dog. They can kill his red blood cells, causing anemia. That's even the onion powder in some baby food. A rare small dose is probably OK. But eating a lot just once can cause poisoning. Look for signs like weakness, vomiting, and breathing problems. Give your dog toys if you want him to be perky. Caffeine can be fatal. Watch out for coffee and tea, even the beans and the grounds. Keep your dog away from cocoa, chocolate, colas, and energy drinks. Caffeine is also in some cold medicines and pain killers. Think your dog had caffeine? Get your dog to the vet as soon as possible. 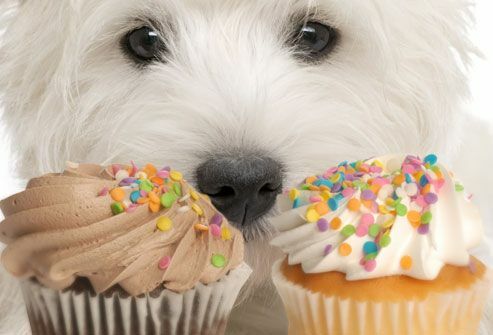 There are better treats to give your dog. 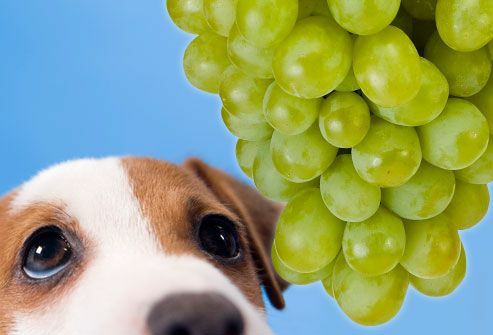 Grapes and raisins can cause kidney failure in dogs. And just a small amount can make a dog sick. Vomiting over and over is an early sign. Within a day, your dog will get sluggish and depressed. 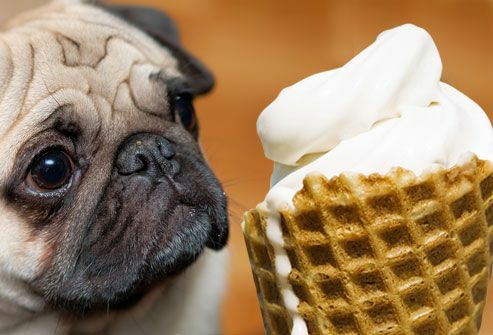 On a hot day, it may be tempting to share your ice cream with your dog. Instead, give her some cold water. Milk and milk-based products can cause diarrhea and other digestive problems for your pup. 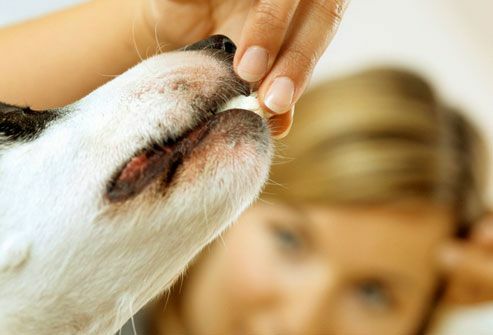 They can also trigger food allergies, which can cause her to itch. 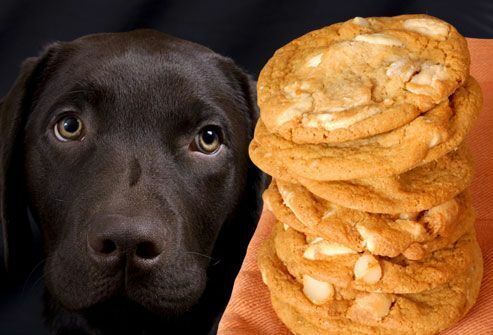 Keep your dog away from macadamia nuts and foods that have macadamia nuts in them. Just six raw or roasted macadamia nuts can make a dog sick. Look for symptoms like muscle shakes, vomiting, high temperature, and weakness in his back legs. Eating chocolate with the nuts will make symptoms worse, maybe even leading to death. Most people know that chocolate is bad for dogs. The problem in chocolate is theobromine. It's in all kinds of chocolate, even white chocolate. The most dangerous types are dark chocolate and unsweetened baking chocolate. 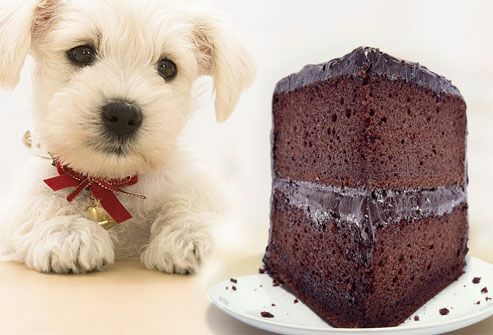 Chocolate can cause a dog to vomit and have diarrhea. It can also cause heart problems, tremors, seizures, and death. 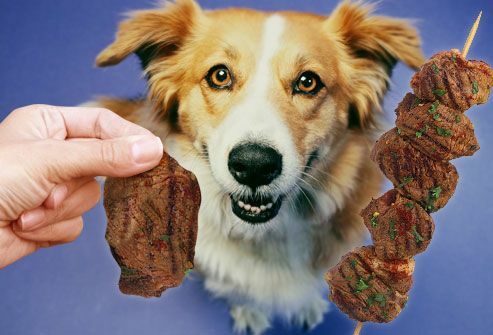 Fat trimmed from meat, both cooked and uncooked, can cause pancreatitis in dogs. And, even though it seems natural to give a dog a bone, she can choke on it. Bones can also splinter and block or cause cuts in your dog's digestive system. The problem with these fruits is the seeds or pits. 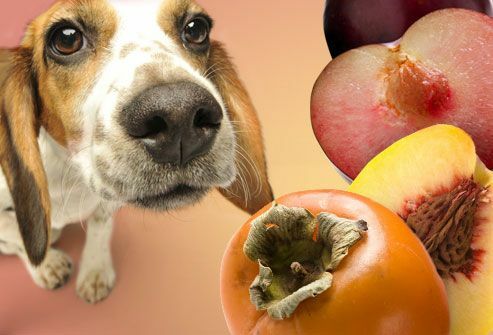 Seeds from persimmons can cause problems in a dog's small intestine. They can also block his intestines. That can also happen if a dog eats the pit from a peach or plum. Peach and plum pits also have cyanide, which is poisonous to people and dogs. People know not to eat them. Dogs don't. 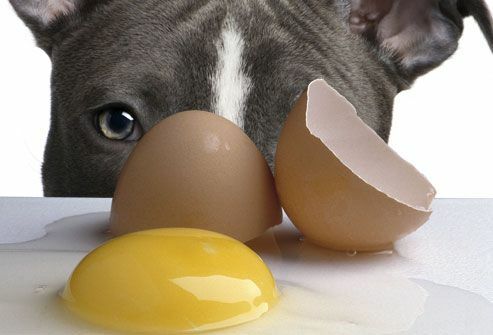 Some people feed their dogs a "raw diet" that includes uncooked eggs. But the major veterinary medical associations don't think that's a good idea. There's the chance of food poisoning from bacteria like salmonella or E. coli. Talk to your vet if you have questions. Like raw eggs, raw meat and fish can have bacteria that causes food poisoning. Some fish such as salmon, trout, shad, or sturgeon can also have a parasite that causes "fish disease" or "salmon poisoning disease." It's treatable, but get help right away. The first signs are vomiting, fever, and big lymph nodes. Fully cook the fish to kill the parasite. 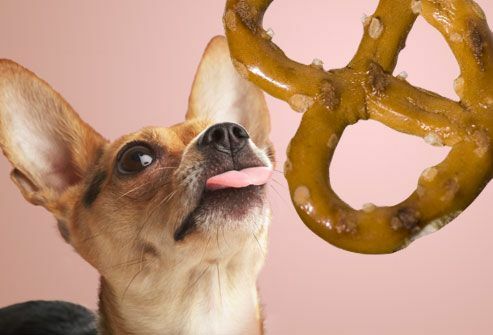 It’s not a good idea to share salty foods like chips or pretzels with your dog. Eating too much salt can make your dog seriously thirsty. That means a lot of trips to the fire hydrant and it could lead to sodium ion poisoning. Symptoms of too much salt include vomiting, diarrhea, depression, tremors, high temperature, and seizures. It may even cause death. 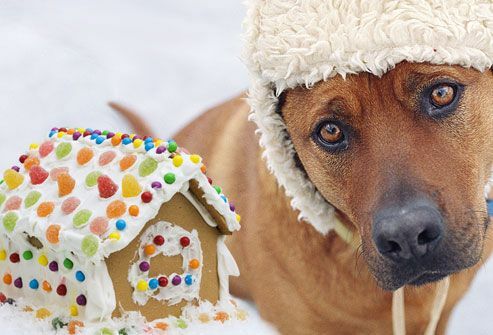 Too much sugar can do the same thing to dogs that it does to people. It can make your dog overweight and cause problems with her teeth. It can even lead to diabetes. Before it’s baked, bread dough needs to rise. And, that’s exactly what it would do in your dog’s stomach if he ate it. 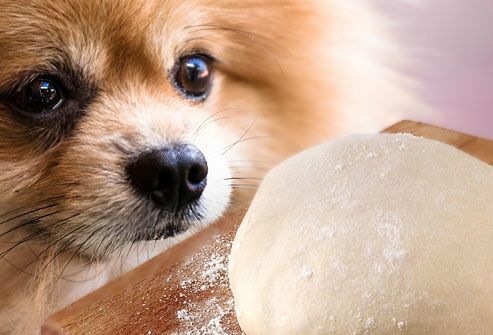 As it swells inside, the dough can stretch your dog’s abdomen and cause a lot of pain. Also, when the yeast ferments the dough to make it rise, it makes alcohol that can lead to alcohol poisoning. Dogs shouldn't take people medicine. It's can make them very sick. Just as you do for your kids, keep all medicines out of your dog’s reach. And, never give your dog any over-the-counter medicine unless your vet tells you to. Ingredients such as acetaminophen or ibuprofen are common in pain relievers and cold medicine. And, they can be deadly for your dog. Many other things often found on kitchen shelves can hurt your dog. Baking powder and baking soda are both highly toxic. So are nutmeg and other spices. 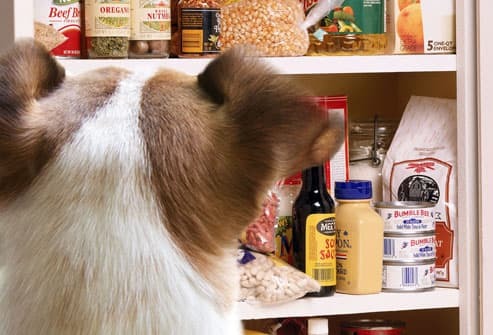 Keep food high enough to be out of your dog’s reach and keep pantry doors closed. 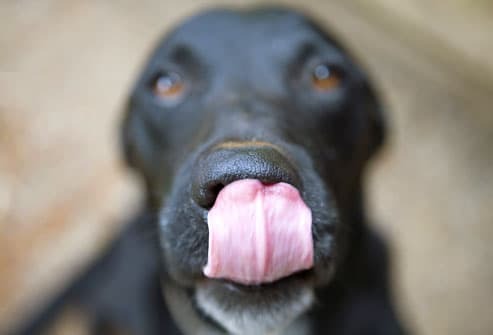 No matter how careful you are, your dog might find and swallow something she shouldn't. 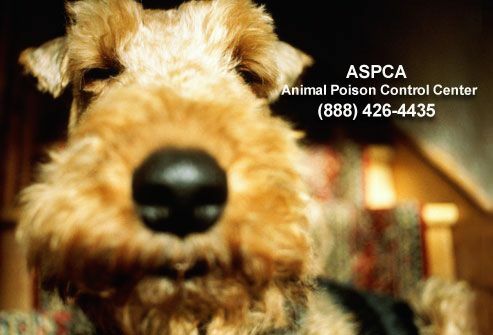 Keep the number of your local vet, the closest emergency clinic, and the ASPCA Animal Poison Control Center -- (888) 426-4435 -- where you know you can find it. And, if you think your dog has eaten something toxic, call for emergency help right away. You can make sure your dog has a healthy, well-balanced diet by asking your vet to suggest a quality dog food. But that doesn't mean you can't sometimes give your dog people food as a special treat. Only give him a little. Be sure the foods are cooked, pure, and not fatty or heavily seasoned. Here are some ideas. Most dogs are fine eating lean cuts of meat that have been cooked well. Take off all visible fat -- including the skin on poultry. 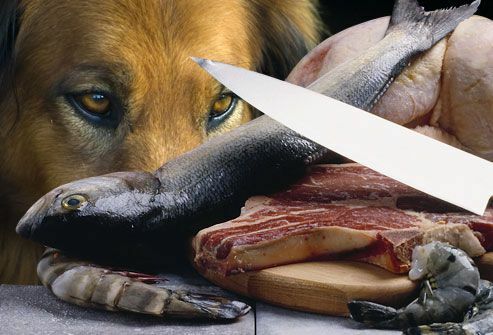 Be sure that there are no bones in the meat before you give it to your dog. 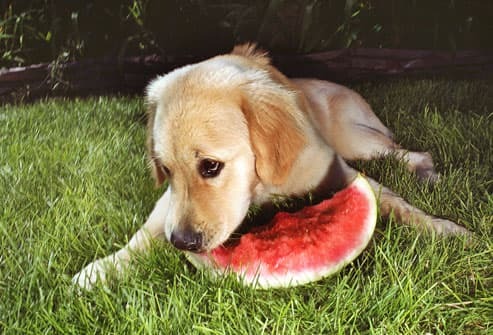 Slices of apples, oranges, bananas, and watermelon make tasty treats for your dog. Take out any seeds first. Seeds, stems, and leaves can cause serious problems. 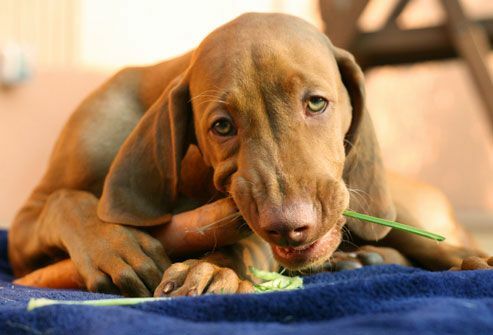 Your dog can have a healthy snack of carrot sticks, green beans, cucumber slices, or zucchini slices. Even a plain baked potato is OK. Don't let your dog eat any raw potatoes or any potato plants from your pantry or garden. 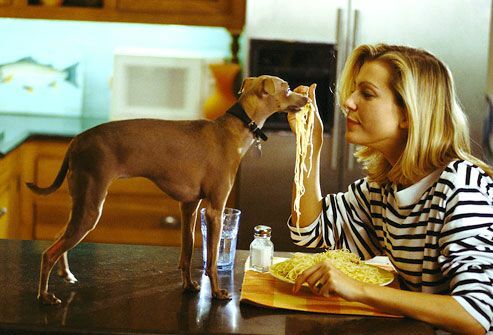 Dogs can eat plain white rice or pasta after it’s cooked. And, a serving of plain white rice with some boiled chicken can sometimes make your dog feel better when she's having stomach problems. American Veterinary Medical Association: "Raw Pet Foods and the AVMA's Policy." Washington State University: "Salmon Poisoning Disease."